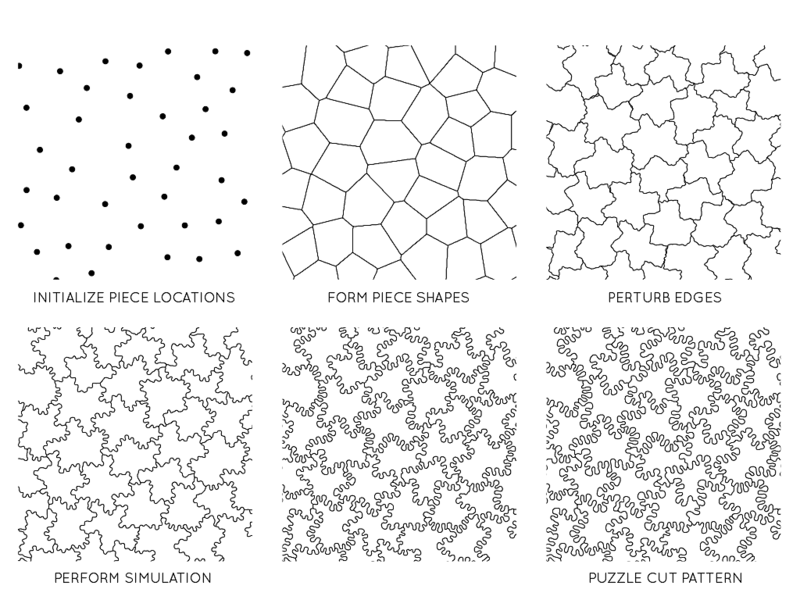 We created a puzzle generating software based on the simulation of dendritic solidification, a crystal growth process similar to the formation of snowflakes that occurs in supercooled solutions of certain metallic alloys. The puzzle generation system has several stages: the core simulation, piece initialization, tolerance checking, and export. 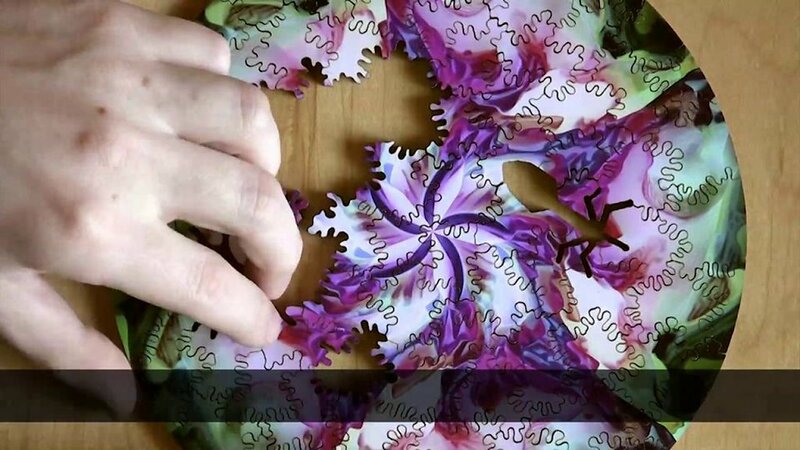 Additionally, we must account for arbitrary puzzle shapes, insert whimsies figures, and allow varying cut styles. 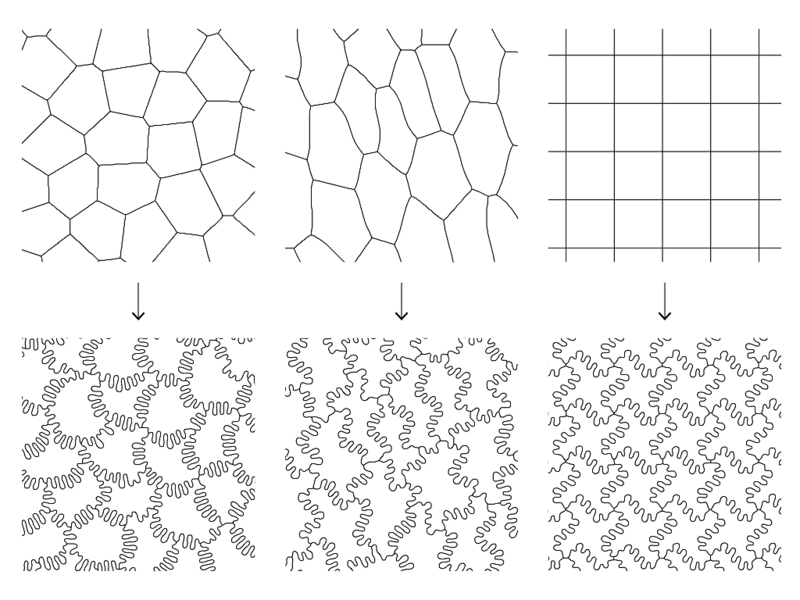 The core component of our cut generation is a simulation of dendritic solidification using a phase-field technique. 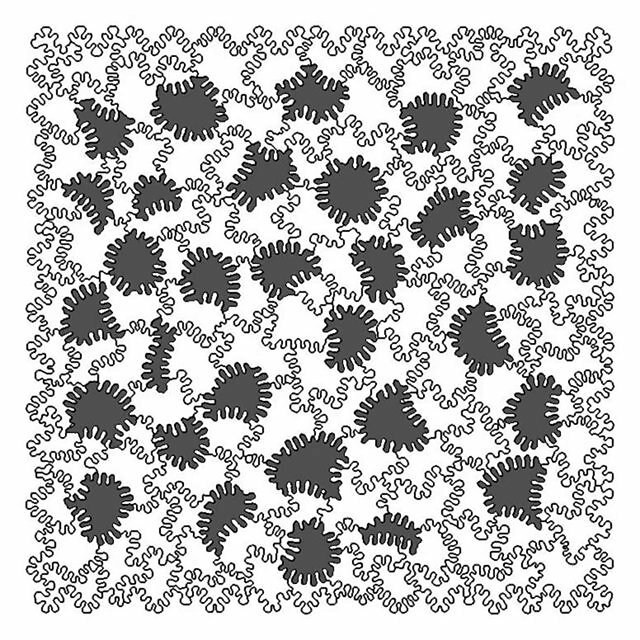 Applying the phase field approach naively to the problem of generating jigsaw puzzles introduces a few problems. Dendritic solidification typically involves a single material in one phase encroaching on another phase of the same material, e.g. a single, solid piece of ice growing into an expanse of supercooled water. In this setup, one phase grows while another shrinks. But for making puzzles, we would prefer the simulation to be symmetric with respect neighbors’ phases: Rather than one piece acting in a ”growing” role and another in a ”shrinking” role, the boundary should evolve with identical dynamics in both directions. Otherwise, we introduce an aesthetic asymmetry in the quality of adjacent pieces’ boundaries. To address this issue, we have to ignore our intuitive notion of the “phases of matter”. The equations governing these dynamics are symmetric, so instead of a solid crystal growing in a supercooled liquid we can think of a liquid growing into a “superheated” solid. Indeed, we can have the liquid state be supercooled and the solid state be superheated simultaneously in simulation space. This allows both phases to grow into one another symmetrically. For more information, read our paper Multiphase Numerical Modeling of Dendritic Solidification for Jigsaw Puzzle Generation.